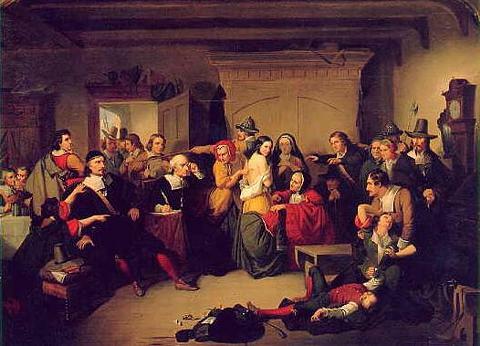 The events which led to the Witch Trials actually occurred in what is now the town of Danvers, then a parish of Salem Town, known as Salem Village. Launching the hysteria was the bizarre, seemingly inexplicable behavior of two young girls; the daughter, Betty, and the niece, Abigail Williams, of the Salem Village minister, Reverend Samuel Parris. In February, 1692, three accused women were examined by Magistrates Jonathan Corwin and John Hathorne. Corwin's home, known as the Witch House, still stands at the corner of North and Essex Streets in Salem, providing guided tours and tales of the first witchcraft trials. 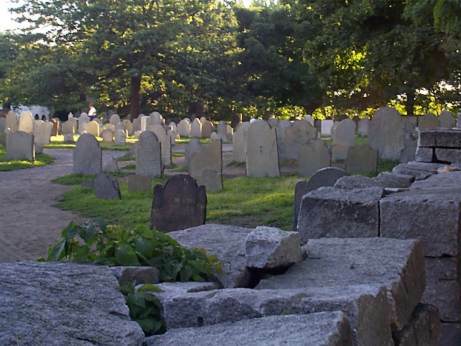 John Hathorne, an ancestor of author Nathaniel Hawthorne, is buried in the Charter Street Old Burying Point. By the time the hysteria had spent itself, 24 people had died. Nineteen were hanged on Gallows Hill in Salem Town, but some died in prison. Giles Corey at first pleaded not guilty to charges of witchcraft, but subsequently refused to stand trial. This refusal meant he could not be convicted legally. However, his examiners chose to subject him to interrogation by the placing of stone weights on his body. He survived this brutal torture for two days before dying. It is remarkable 552 original documents pertaining to the witchcraft trials have been preserved and are still stored by the Peabody Essex Museum. A more provoking commemoration, the Salem Witch Trials Tercentenary Memorial dedicated in 1992, can be found adjacent to the Charter Street Old Burying Point.